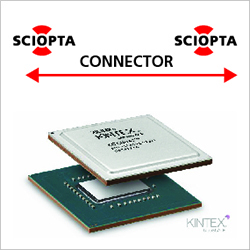 CONNECTOR is a SCIOPTA methodology that connects SCIOPTA systems on the different ARM cores in a Xilinx Zynq Ultrascale MPSoC. The CONNECTOR enables the developer to use the same clean message based interface of SCIOPTA in distributed systems as on a single CPU system. Message passing beyond processor boundaries uses the same system calls for transmitting and receiving, although the processes reside on different cores. SCIOPTA is not only certifying Real-Time Operating Systems and Middleware. As device drivers are usually part of the safety function, they also need to be certified according to the same level as all other safety software in an embedded system. 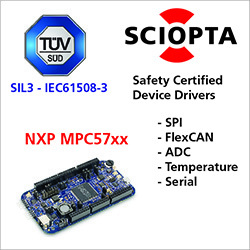 Therefore SCIOPTA has certified five device drivers for the NXP PowerPC MPC57xx processors. This includes SPI, FlexCAN, ADC, Temperature and Serial Device Drivers. They have been tested by TÜV SÜD according to IEC 61508-1:2010, IEC 61508-3:2010 and IEC 61508-4:2010.